I got the great opportunity to play with the new PMC Sterling in November and I will love to share with all of you my experience and what I think about this new type of clay. 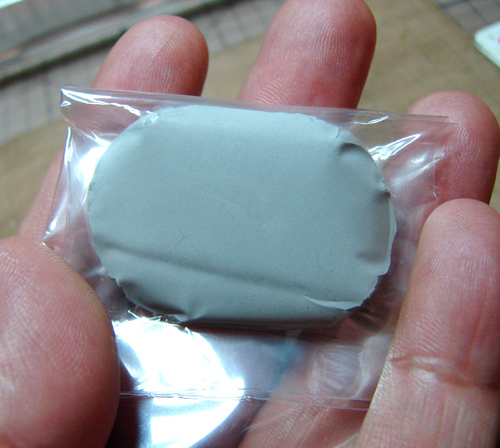 The clay looks very similar to the PMC Pro, the color is darker than the original PMC. 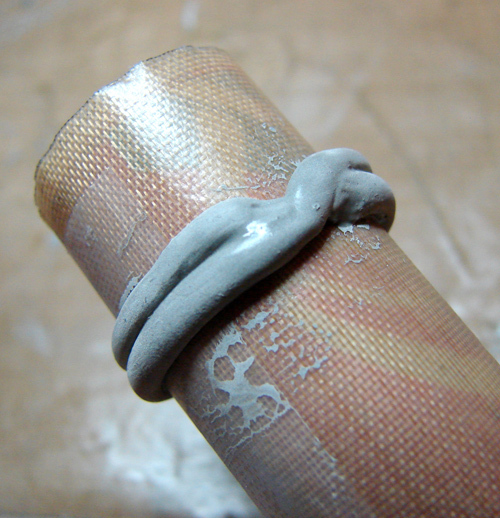 When I took the clay out I noticed the texture is great and very easy to work with, I decided to make a ring first and I made a snake with some of the clay to form the band for the ring. I used a plexiglass to make a long snake and I rolled it around a mandrel. I went 3.5 sizes bigger to get the size I was looking for, a size 9. I do not used any inserts in my ring when I fired it. 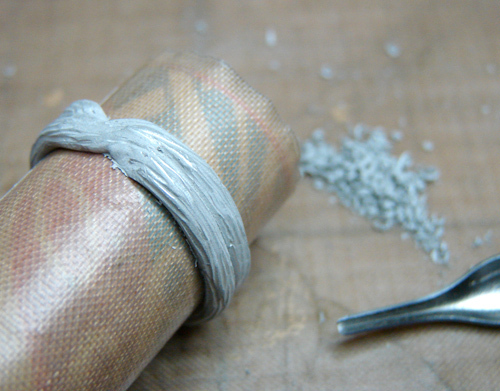 The PMC Sterling has a longer working time than the PMC3 (this is the type of clay I usually use in all my silver work.) In case the clay gets dry, you can add a little water and it gets soft very fast, almost immediately. Carving is also great in this type of clay, it goes very easy. This is something I was very eager to try since most of my work has carving into the designs. It carves very smoothly and with no problems at all. TIP: Always save the carving scraps, these can make a great texture in your work, you will see it in my finished pieces at the end of this post. Hand sculpting and forming is fantastic because the clay does not dry fast. This gives you the perfect time to hand form flowers or other things. 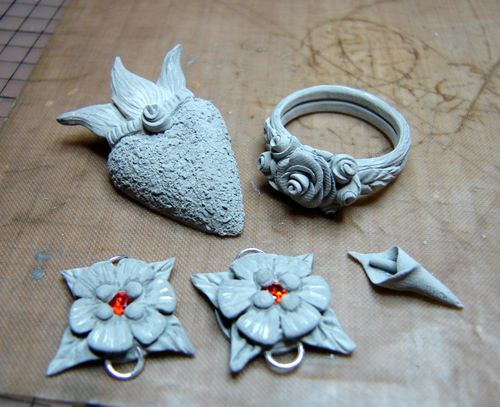 I hand sculpt a lot in my work and I was very happy to see how easy it is to do it with PMC Sterling. I also made earrings and a pendant. For the earrings I decided to add some fire in place CZs and I embedded two sterling jump rings into each earring. I used my carving scraps to add texture in my heart pendant. Because my pieces were more than 3mm thick I decided to fire them to a longer time that the suggested time in the package. I first fired them in the open shelf, like we do with any other type of PMC (except PMC Pro), fast ramp to 1000F and hold there for 40 minutes. I waited until the pieces were cool inside the kiln; I also waited until the pieces were cool because I had fired two CZ Hessonite Garnets and we always have to be careful not to take the pieces very fast because the change of temperature may crack the stones. The second firing was done with a steel pot and activated carbon. I added half an inch at the bottom and added my pieces in one layer, covered them with another half an inch and added the top of the pot. I fired them inside the pot fast ramp to 1500F and hold for 45 minutes. I left the pieces cool down inside the pot in the kiln before I took them out. I brushed them with soapy water and a brass brush. After this I added LOS Gel patina and brushed some of the patina off before I added the pieces inside a tumbler. I usually use a rotatory tumbler but this time I decided to give it a try to a magnetic tumbler. I was AMAZED at how fast this wonderful polishing machine can give your pieces a beautiful shine. I will have to start saving money to get myself a bigger size, since some of my pieces are bigger and do not fit in this size tumbler I have now. It is worth it !!! These are all the pieces I made with 25 grams of PMC Sterling. They are not very thin, so if you make pieces that are thinner and small in size you will be able to make more out of the 25 grams of PMC Sterling. The cost is very similar to the PMC3 and I feel it is great to have it like that. 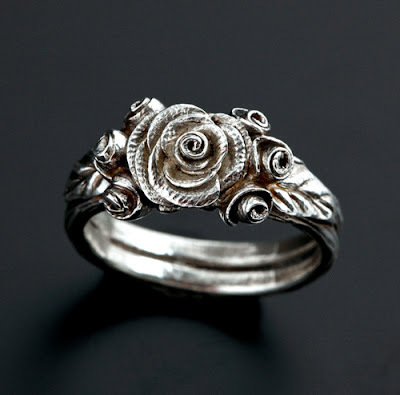 Now you will be able to create pieces that can be mark as .925 (sterling) and they will be stronger than fine silver. I do want to mention I will be firing for almost two hours on the second step firing of the PMC Sterling. I want to be 100% sure they are totally fired to their best strength. 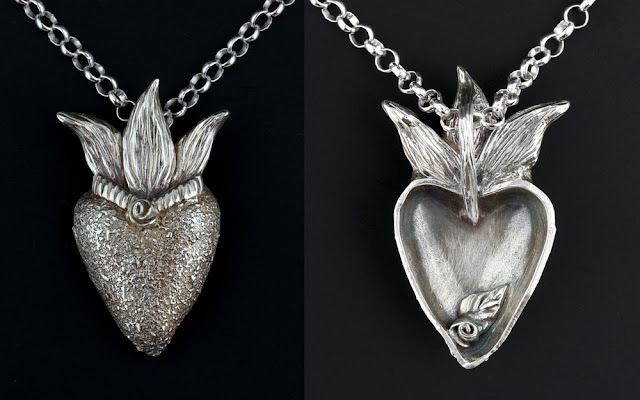 I am saying this because I tested the little Calla Lily and I felt the piece was not fully sintered when I tried to curl up the point of the flower after fired. I will let you know of my future firings. The pieces are beautiful and easy to polish and I am sure you will enjoy working with it. Thak you for the info Lorena. 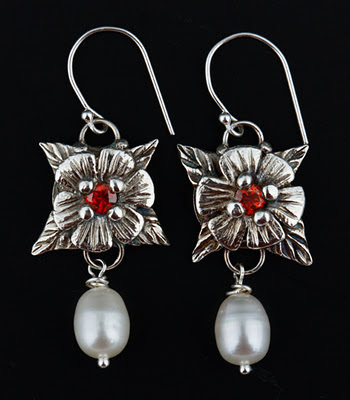 Do you think you will be working more with PMCSterling than PMC3 due to the fact that your pieces are more sculpted and detailed or because of the strength of Sterling vs. Fine? Gorgeous Lore! I didn't take the opportunity to make "pretty" things with the sample I received. I made sizing test strips and experimented with making slip and joining fired to fired. Good things to have done. But I have nothing to show for it really. The next batch of sterling I get, I'm makin' beauty! This is what I use to carve my work. You can find it in any craft store (the tool alone), I use the "v" tip number 1. I think I will use PMC Sterling because it is stronger but I will continue to use PMC3 ;o). I am sure you will make great beauties !!! You have to show us ! Thanks for the information Lorena! These are very lovely! When I tested my rings had different shrinkage, so I will try the 2hr firing and 3.5 size larger next time. Wow I think your pieces are magnificent - if I had availability to fire - you would have an serial follower!!!! I think you are such an awesome artist! I would wear your pieces with pride!!!! 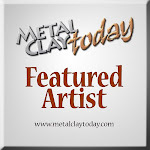 Keep creating with metal clay b/c you are talented beyond words! Thanks for sharing your findings. It's been a while since I use silver clay. I've been occuppied with polymer clay. 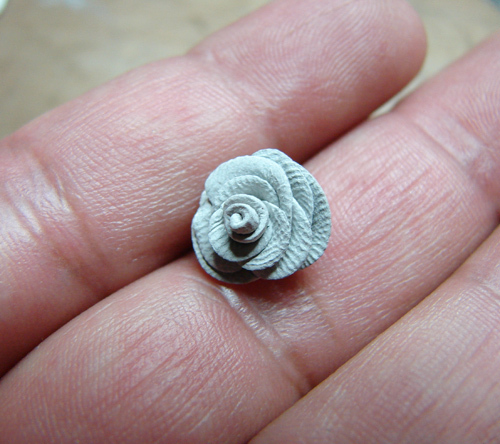 The sterling clay might make me go back to trying. Those earrings and Rosa ring are awesome. Just love them. BTW Feliz Navidad! Lorena, thank you for the overview! Now I will have the confidence to use my PMC sterling when it arrives this week! Beautiful work as always! Love the ring and EL CORAZON. The little rose in the back is perfect. Thanks for all the info. I'm excited you embedded sterling jump rings! Beautiful pieces. Thanks for the info. Thanks for the review, Lorena. I want to get back to the clay. Your work is gorgeous. I'm always in awe of your carving ability. Lorena, thanks for sharing your experience. I do still wonder, however, if you noted any difference between open shelf firing and with the carbon. I would be much more persuaded to buy the sterling clay if there was no carbon involved. Great pieces in your blog, as usual! Cheryl: The open firing is for a lower temperature (1000F) to burn the binders, you do not see a big difference in the color because it does not stays for too long. The carbon is necessary to avoid oxidation because of the copper content in the clay. Why you do not like the use of carbon ? Hi again, Lorena. I don't know; it (the initial burnoff and then the carbon) always seems like such more of a (dirty) hassle. That is why I have lots of bronze and copper clay just sitting. It's laziness, really. I forgot about the burn-off step for the sterling, and for a moment, thought you were saying you could fire it totally open-shelf. Thanks for the notes on your first PMC sterling firing. I have my clay out on the table, ready to go. 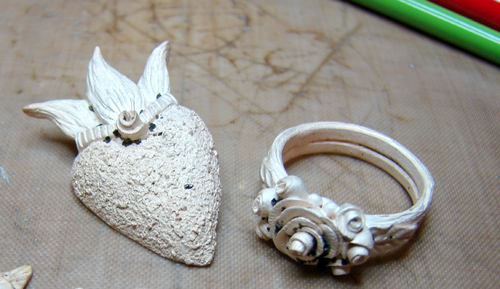 I've stalled out trying to decide whether to make test pieces or just go for it. Now that I've seen your results from just going onward, that's what I'm going to do! Oh my, those pieces are amazing! Hey Lorena- great review. Wondering why you decided on 3.5x for the ring size- isn't the shrinkage rate supposed to be the same as pmc3? Thanks for the recommendation- I bought the magnetic tumbler- looking forward to getting it! Hi Lorena! Beautiful work! So is using a torch with the sterling clay out of the question? Just wondered if you have tried it. The shrinkage is more like PMC Pro, this is why I decided to go higher. You will love the magnetic polishing machine !! Shannon: I know you can do the first stage with a torch, just to burn the binders but you ned to use the charcoal (carbon) inside a steel pot to fire it because of the copper in the clay. I enjoyed this article and all the comments. I purchased some of the silver clay months ago, but was reluctant to try it. But your pieces are so beautiful that I have to get busy and try it. Your information on the firing was very helpful. I didn't know about the firing at a low temp first to bind, then the high temp because of the copper. I feel more confident to try it now. Thank you. I am glad I help you. My question to you is, what type of clay did you buy months ago? PMC Sterling has been in the market for less than a month. If you have the other types of PMC, let me know and I will tell you how I fire them too. It is very easy. 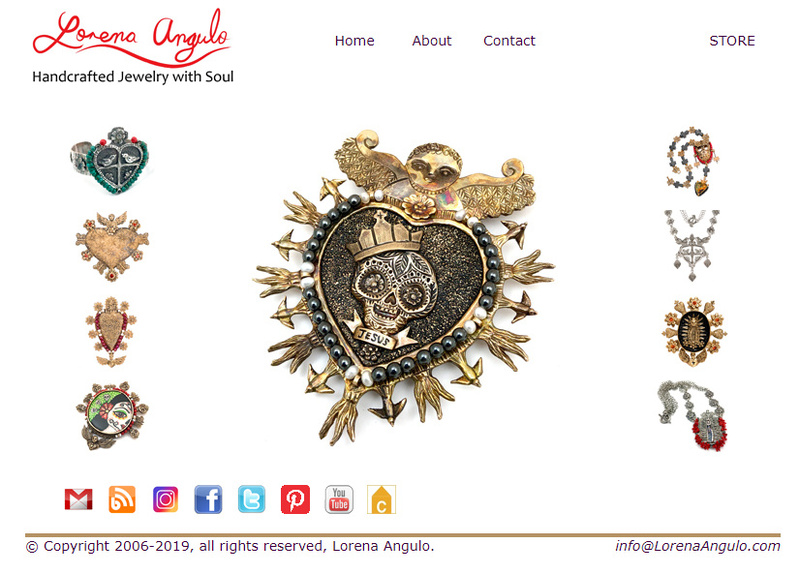 i'm so happy to have found your site - what beautiful work you do! i've been hemming & hawing over the sterling clay, now thanks to your review i'm ready!the whole carbon thing seemed a bit scarey, thanks for your detailed review! I am glad my post help you. Let me know how it goes in your firing. Hi. 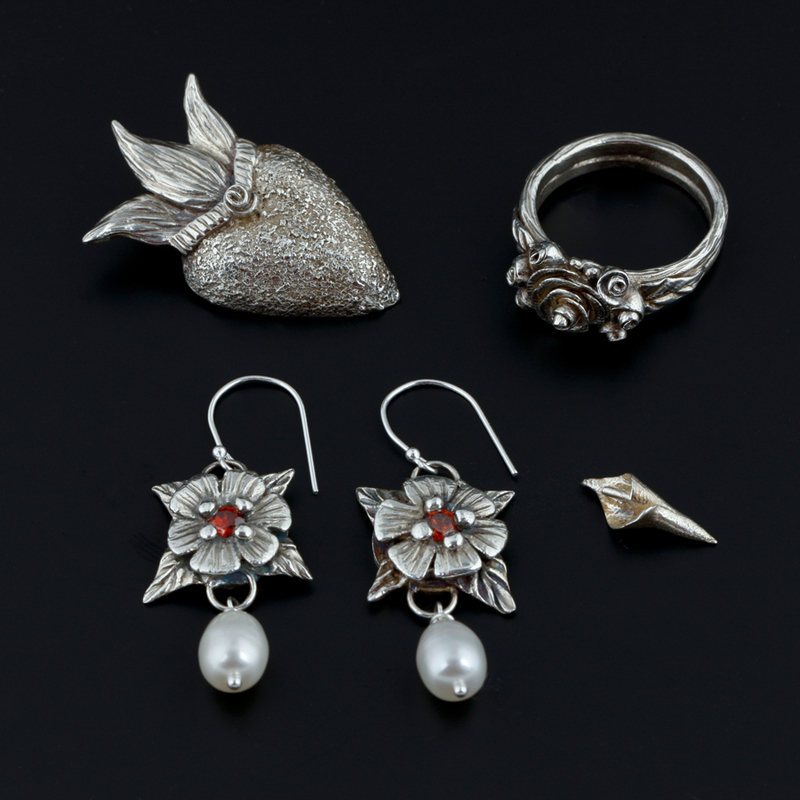 Lorena, I love your work and I have been following your progress working with sterling silver clay, I finally bought some and made some pieces of jewellery, I fired them today and they blistered quite badly. Have you had this problem or do you know why this would have happened? I followed the recommended firing temps. What type of vessel did you used to fire the clay? Can you tell me more about your firing schedule? I fired at 538c for 40mins on the kiln shelf, then 815c for 2hrs. in a stainless steel pan with a lid. I have a paragon SC2 kiln.